Communists have a well deserved reputation for altering history or "sanitizing the past to suit their purpose. But that's all in the past, they are open and honest now.... they would never use deception to advance their agenda, would they......? 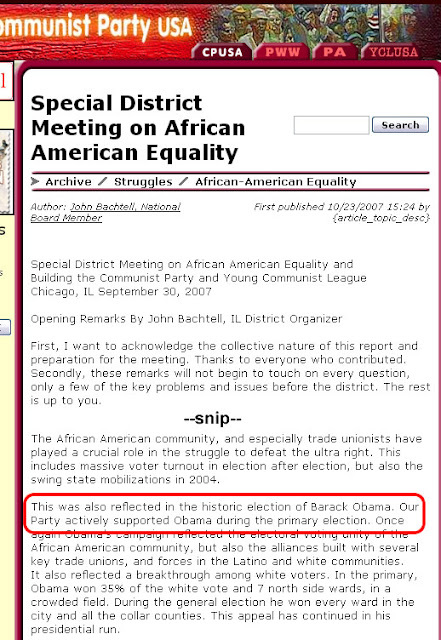 President Obama has a long history with several radical groups, including the Communist Party USA. The communists naturally want to protect their "friend" from negative fallout should such associations become publicly known. Below is a screen shot of the original article, taken as it appeared on the Communist Party USA website as at December 30, 2007. 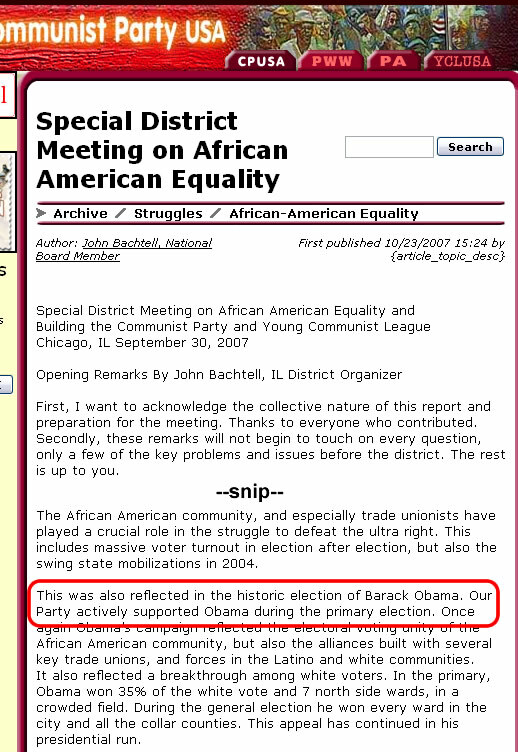 Note the reference to Communist Party support for Obama in the 2004 U.S. Senate primaries. Note that the sentence, "Our Party actively supported Obama during the primary election." has been scrubbed from the above article. Rub the communists face in their clumsy attempt at deception. Email this post to every patriot you know. Also send it to any honest Democrats in your circle of friends or colleagues and ask them what they think of this blatant attempt to hide the Communist Party's ties to the President. The CPUSA also wrote in their official reaction to Obama's election as President "Obamas ascendancy to the presidency feels like a springtime of possibility." A Communist's springtime of possibility is our winter of discontent. What's also funny is that even CPUSA is running from Obama. I have started keeping a back up on all research like this because they scrub things fast. Glad you had this to put out there. Interesting to know this fact. So i wonder,DID they change the date that hawaii became a state?? In 1961 my mom said they were still negoiating state hood for hawaii. This does not shock me in the least! Thank you for helping expose this nonsense. 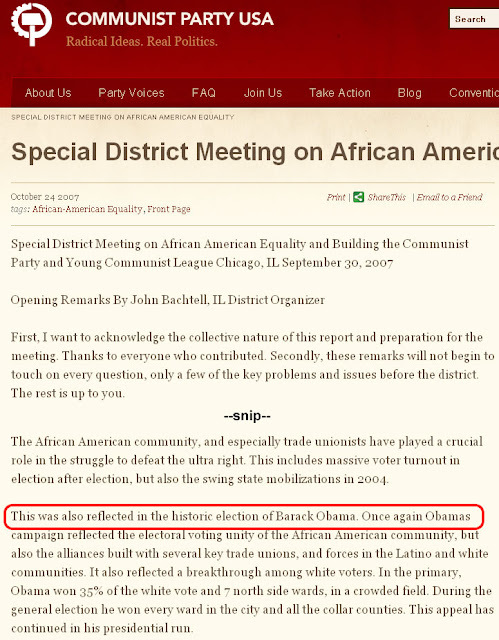 So, it appears the CPUSA is concerned that references to the communist ties of obama may hurt his 2012 run. Interesting. 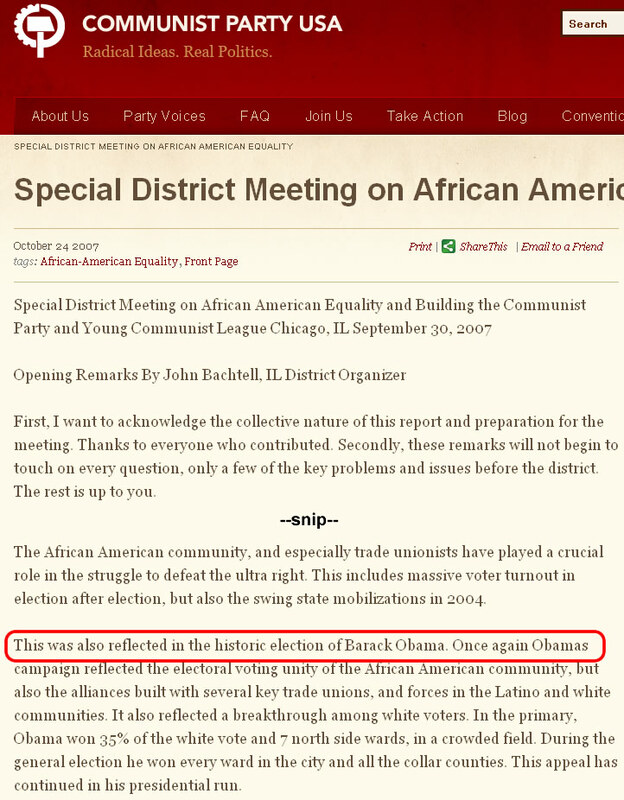 it appears the CPUSA is concerned that references to the communist ties of obama may hurt his 2012 run. Interesting. Patriotic Third Graders Sing "Home of the Brave"